Call 732 - 786 - XXXX and ask for Marc***********************Hindle Exhaust - Corbin Smugglers Trunk - Corbin Rear Fender - Corbin Seat - Triple Play Rear Lamps - Kuryakyn Throttle Boss - Kuryakyn Helmet Lock - Kewl Metal Mirror Extentions - 4" Risers - Hwy Pegs and Floorboards - Calsci Tinted Windshield - Parking Brake Cover - Extended Warranty Good Till 6/24/14Spyder? SE5Experience every thrill of the Spyder Y-Factor, plus a new shift in open road freedom. Discover a new semi-automatic transmission that allows you to shift gears with just the press of a button. Talk about easy riding. 2009 Can-Am Spyder SM5 Motorcycle is a 2009 Can-Am Spyder ATV in Perrineville NJ. 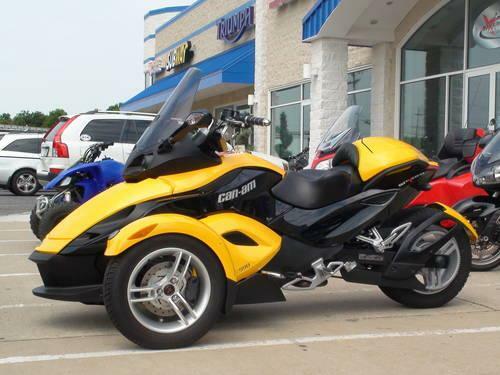 Find other listings by searching for 2009 Can-Am Spyder ATVs in Trenton on Oodle Classifieds.